Spend 5 hours of free time at Krka National Park, where you can swim and relax under Skradinski buk, a travertine waterfall on the Krka River. This day trip from Split includes minibus transport to the town Skradin, a short boat ride down the river to the falls, and entry to the Ethno Museum. Board a minibus for Krka National Park, departing from a central location in Split. The 1-hour scenic drive takes you to the small town of Skradin, where you will embark on a short boat ride down the Krka River. Arriving at Skradinski buk, you'll find the largest travertine cascade system in Europe, with 17 steps up to 1,312 feet (400 meters) wide. You'll have 5 hours here to explore independently; swim in the crystal-clear waters of the lower lake of the Krka Waterfalls — the only falls in the park where swimming is permitted — or see them from a different vantage point along the wooden walkway. You can follow the footpaths to an old water mill, stone houses, the Ethno Museums, restaurants, and more. In the afternoon, meet up with your group for the return trip to central Split. Definitely recommend! The price of the tour basically gets you a bus transport to and from the falls. It does not include a fee to enter the park itself 90kn for adults, 30kn for students you give to the tour guide, but it's so worth it! You take a boat down the river for 30 minutes until you reach the falls, and from there you get to explore the falls on your own for about 5 hours. It's about a 1.5 mile walk all around the park with lots to see. The Krka Falls are absolutely beautiful and definitely a must-see! I recommend bringing some snacks or a lunch since there isn't much variety at the park. Our tour guide had a great sense of humor too! The day we visited Krka unfortunately the weather was not very good. Very wet and windy, we had to buy ponchos. The rain went off around 2pm but I wouldn't have changed the day at all. The rain made it cooler, and because the weather wasn't great the park was quieter so you had more time to enjoy the stunning views and more space for swimming. I was told on hot days it can have as many as 10,000 people. Would recommend tour to anyone visiting Split, natural beauty at its best and a great day out of the town. The tour was very well-organised. I'm so glad I booked this tour! We had almost 5 hours free time at the park which was plenty of time to do the boardwalk twice I'm a fast walker, eat lunch and cool off in the water. Krka National Park is such a gem! This was a great tour, you get a mini tour of the waterfalls at the start and then you have more than 3 hours of free exploration of the park and the trails, which is what I was looking for and enjoyed a lot. Good for transportation to the falls and some basic info, which was all I was looking for. The swimming area was closed the day we went, and so our tour left an hour earlier. At first I was a bit annoyed that the time was cut I would have spent more time browsing the shops, but we still had enough time to walk through the path and get something quick to eat after. An easy way to see the falls! Great trip, but waterfall is too busy these days. This tour isn't so much a tour, but more transfers which was perfect for us. We wanted to spend many hours exploring the park and found that this tour was the only one that would offer us this. We were picked up on time by a friendly tour guide who took us to purchase our tickets then get the boat over, which was lovely. The national park itself is beautiful, we spent an hour and a half in the water I would highly recommend taking water shoes, a waterproof camera, and something to keep your valuable in as you are not able to see the bags from the water. The water was beautiful and although it was a busy day we had a wonderful time. We then grabbed some food from the snack stalls then hiked around the park and took lots of beautiful pictures. I would highly recommend this tour if you would like the flexibility to explore this park at your own pace. The trip was inexpensive and worth every penny. The tour was not overbearing and I appreciated the amount of time we had to spend in the park. The boat cruise was a nice addition as well, I would recommend sitting at the front of the boat during the cruise if possible and bringing our own food as there were not a lot of options at the park. Overall, it was a great experience and I would do it again. waterfalls, at the halfway point. We were not aware that we would walk back down the opposite side of the waterfall photo spots, only to have to rewalk the same first half again. Croatia was experiencing a heat wave and it was torture to walk past the bottom swimming area and not have the extra time to get back into the water. We then had to walk the same first half of paths again, in the incredible heat, to get back to the buses. Could not believe we walked the entire area 1.5 times when we would have preferred to walk only half of the path area. I wish we had stayed in the water much longer in the beginning of the day, and enjoyed the area at the bottom of the falls much more. The tour was very well organized and there was no question about what you had to do next. The guides were very professional and knowledgeable. The buses we took to Skradin were very nice. Definitely full but not overcrowded. 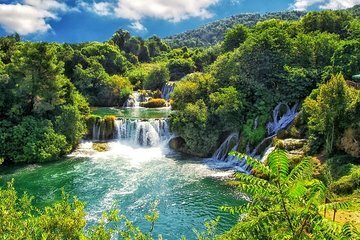 I was aware that this tour only covered the cost of the trip to and from Skradin and I would be responsible for paying for the tickets for Krka National Park. Many others on this tour seemed to not be aware of this. Once you arrive in Skradin, you purchase your tickets for the ferry and the park and then have to go stand in line for the ferry. The line is crazy long but went by fairly quickly. The ferry ride is short and gets your right into the park. Then you are left on your own at the park. We visited Split during the busy season so the park was crazy busy. There is an opportunity to swim but after looking at the water and the surrounding area I changed my mind and we just did a hike around the park, had lunch and coffee. You make your way to the bus stop at the other end of the park and the guides are waiting for you with their blue umbrellas. You board the bus and you are on your way back to Split. Again this was a very well organized tour. The park was just not for me. The waterfalls are gorgeous but you have several hours at the park to fill. If you like thins well organized on your vacation and want to know exactly what the plan is, then definitely book this tour. The guides are with you each step of the way and are extremely helpful.